I am so blessed to be able to call some great quilters my friends. 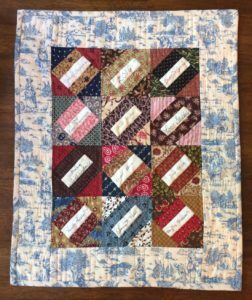 Two weeks ago, we combined two groups and the Doll Quilt Divas met with the Chintz Chicks for the day, sharing lunch and lives and of course quilts. 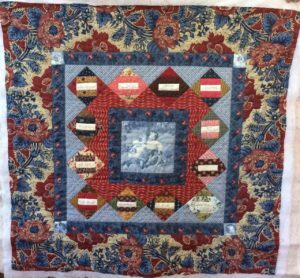 Almost two years ago we had done a block exchange and several people brought their Signature doll quilts to share. I was delighted to see such variety in the way people put together their blocks. There were 12 of us who participated in the exchange and we all wanted to do them in civil war reproductions fabrics. This first one I have here was made by Jane and I love the way she added red triangles to separate her blocks and then placed them on a wonderful tan fabric. Isn’t it interesting? I should have taken better notes with my photographs. I believe the next one was made by Deanna and features a beautiful blue toile as the outer border. Nicely done. The next one, which was made by Shona, is a very similar setting but it is set with a dark blue fabric for the border and of course beautifully hand quilted. 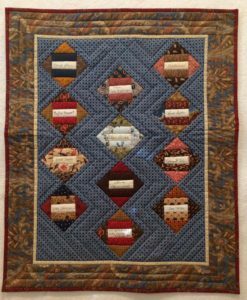 I would have expected no less of Lorie than to create a complex design and then hand quilt it. She is not quite finished so I have tried to crop it so you don’t see the edges of batting sticking out from the quilt. I just love her little toile scene in the middle and the way she fit the border print (with mitered corners) around all the signature blocks. It truly looks like it could have been made in the mid-1800s. 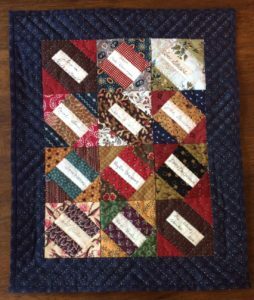 The last quilt I want to share is the one I created. 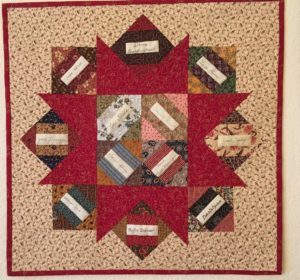 I chose to offset the signatures on point with alternating triangles and then added a skinny border before the final chintz border. What fun it is to exchange blocks among friends and watch the creativity develop. I think we may have to do this again sometime soon! Thanks ladies for sharing. Just for You – Quilt Quote “Dull women have immaculate sewing rooms”.